At exactly 11:00 PM (23:00) GMT on Monday, 14 Nov 11, turn toward the Skies and join together in One Silent Minute of Meditation, Contemplation, Reflection and/or Prayer…Whatever feels right to you. We are going to light a candle and remember those from our house and so many others that crossed the Bridge this year and wish them a safe journey until we meet again. Mom has been thinking back on this year. She wants to remember the good things: Chiclet got adopted!!! The memorial kittens were caught and found homes!!! The neighborhood ferals were (mostly) TNR'd (and Blackie and Annie are seen most days by the neighbor) - mom will be back on the hunt for that darned calico in the spring!!! There have been some great adoptions from the shelter and the other rescue mom helps. And the transports are always entertaining!! But this has been a tough year too. Harder than mom can ever remember. Prior to this year, she had 3 fosters die here. This year we have lost 8: Sultan, Swizzle, Mimosa, Midori, Roxsas, Riku, Sora, Kletus and Mowgli. We know other fosters (and rescues like Chrystal) that have had major losses as well. In one week at the shelter there was an adult that had to be euthanized for illness, 2 hit by cars and 2 kittens died. So, we are taking a moment to remember.....and hoping we can get through the end of the year and start fresh in 2012. That is such a good idea to remember all the little ones that had to leave us and all the good times. Like Maggie deciding that Mom was all right etc. Take care. Hope Baloo makes it. Purrs to you today - it seems like there has been an exceptional amount of sadness for a lot of foster humans this year. 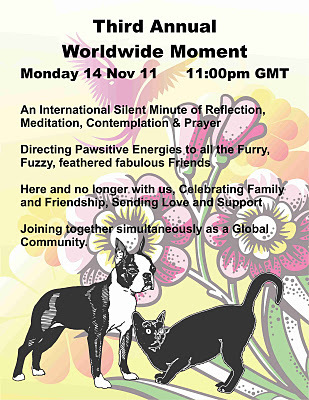 We will be participating in the Worldwide Movement today also. We shared that moment with you and the rest of the blogosphere. Our sweet ones are gone but never forgotten.